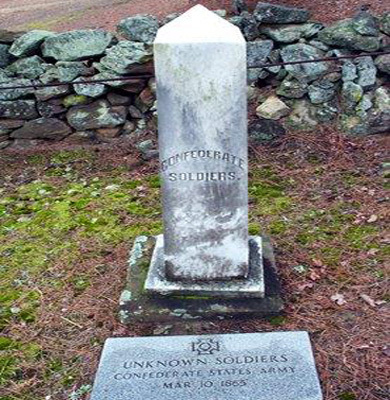 This memorial marks the spot of a mass grave of Confederate soldiers killed in the March 10, 1865 battle of Monroe’s Crossroads. The memorial is a white marble obelisk 4 feet high with a square marble base on top of a second base of tan sandstone. It was placed, most likely in 1870, by the women of Argyle as a memorial to men buried at this location but also to men buried on other fields. In 1993 the U.S. Army added the gray granite marker with a Southern Cross in front of the obelisk. The plot is bordered by 4 concrete pylons connected by a steel cable next to a low wall made of field stones. This was one of the first commemorations in North Carolina to memorialize Civil War dead, either being the second or third after the 1868 monument in Fayetteville. 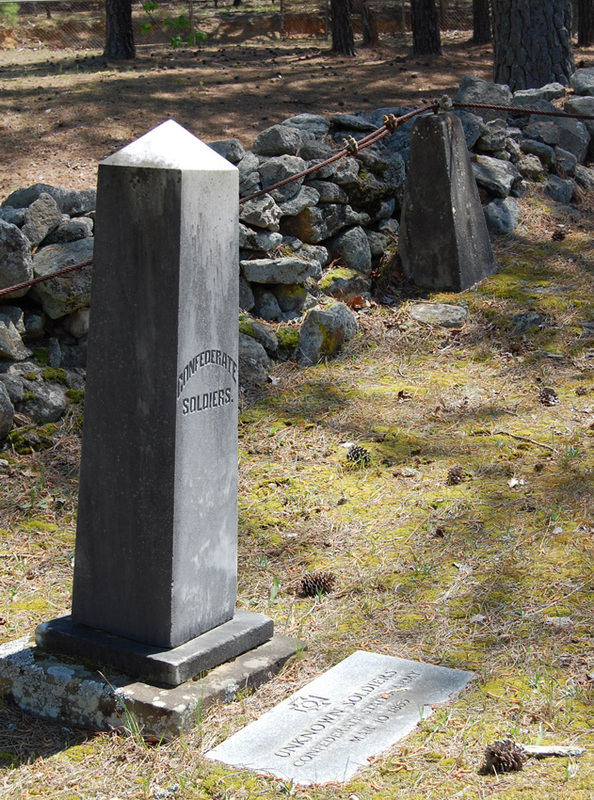 The marker at Long Street Presbyterian Church was one of the earliest erected in North Carolina. It is indicative of many early commemorations which were placed in cemeteries to honor Confederate dead. The men buried at this site were either killed in action or died of wounds received at the battle of Monroe’s Crossroads on March 10, 1965. The remains were moved to this cemetery after the war. This is the only mass burial on Fort Bragg lands. Although the number of men buried in the grave is often given as 30 the true number is not known given no post-war records of the internment have ever been found. A ground-penetrating radar study in 2008 was inconclusive because all it revealed was that it was a very large pit with a lot of dirt scattered about. Long Street Church is always spelled as two words, named for the very long colonial road of Yadkin, once an animal trail, then an Indian trading path, then a wagon road, now an ARMY road. The ARMY keeps the one word spelling for the road on their maps, so that confuses many people who are aware that many roads on Ft. Bragg are named for famous military figures. which is not true in this case. The obelisk is located in Ft. Bragg Military Reservation, Argyle, Little River Township. It stands in the cemetery of Long Street Presbyterian Church on Longstreet Road. The marker is in the graveyard surrounded by burial sites.